Patterns are repetitions that occur in time. There is no realization of a pattern without the temporal element that makes possible the perception of something that repeats. Time, on the other hand, is unfathomable. We develop strategies to perceive it, demarcating seconds, minutes, hours and years. We think we can preserve it somehow, such as when we use photography to recall a moment that is gone. However, the reality is that time escapes us all the time, at every breath. The perception of time has been problematized by many theorists that study the impact of technical and technological inventions in our everyday life since the end of the 19th century with the Industrial Revolution. With the advent of the telephone and television broadcasts, the exchange of information starts taking place “live”. If before we would take days, weeks or months to receive some information, now, with internet and mobile devices, this information becomes available almost at the same time that it is produced for geographically distant locations. Time and even space become ubiquitous. GIFs are a typical phenomenon of the ubiquitous online networks in the early 21st century. Invented in the late 1980s, they were a way to produce, transmit and store images in low resolution compatible with the technology of the time. Today, this objective was diluted and they represent the dissemination of patterns that, precisely because of its scope, communicate with much of the web users, becoming memes, cultural phenomena whose information is propagated through the internet with great impact, viralizing. As soon as they are produced and disseminated, these memes are lost because of their ephemeral nature, but do not cease to exist. Thus, like memes, we can say that GIFs are paradoxical. Ephemeral and permanent, that is, related to patterns, therefore, to something that is formed on time, even if that time is short and ubiquitous. GIFs and memes are generally produced by anonymous, but, increasingly, there are artists that choose this way to develop their poetic. In this edition of FILE, we present a selection of more than 40 proposals that emphasize the own medium structure addressing patterns, emphasizing or breaking them, whether they are behavioral (individual and social) or formal. The highlight of the exhibition is “Dust Loops”, by Sumit Sijher. As the name suggests, the GIF contains points that move along the frame as dust particles. The movements seem chaotic and random, but the sequence has only 20 frames that repeat in 2 seconds. This makes curious the fact that we cannot follow the complete trajectory of a particle over these 2 seconds, not even over 10 or 60. According to the artist, we would need half an hour for this. This GIF meets the proposal of this exhibition, for time here is fundamental for its comprehension. 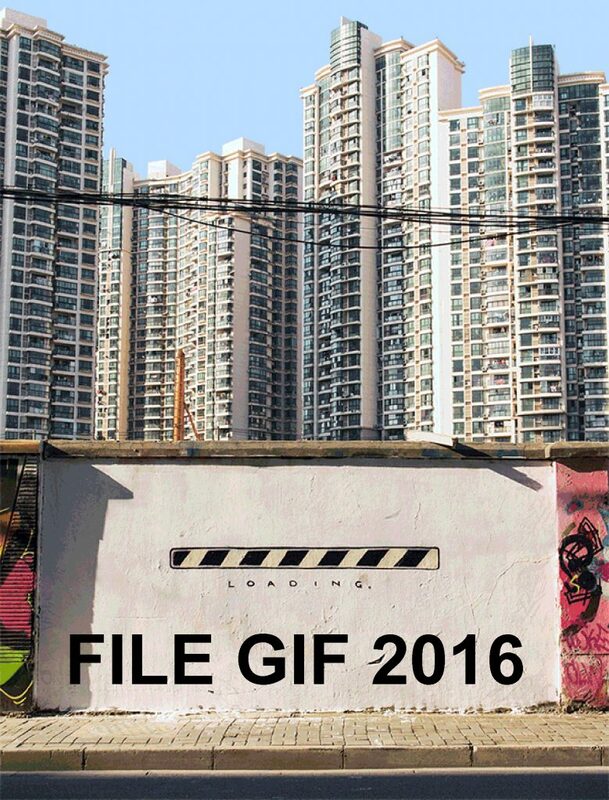 It is a way to expand the notion of GIF, whose visualization usually is very brief, as well as its creative possibilities. The production of Sijher and of all the other artists in the exhibition can be found online, spread through the internet in several sharing websites and platforms. They represent part of the diversity of GIFs produced in recent years, which result from different creative processes with algorithms, photographs, drawings and animations, but have in common the repetition that occurs in the physical and online networks.